Boost Mobile today has announced that the new BlackBerry Curve 9310 will be available starting July 10th. The device will be paired with a new talk and text plan, which includes worldwide unlimited BBM, for as low as $30 a month. The Curve 9310 features a 3.2MP camera, BlackBerry 7.1 OS, wifi and GPS and will be available for $99.99. Keep reading for the full press release. IRVINE, Calif.--(BUSINESS WIRE)--Boost Mobile, a leader in the no-contract wireless industry with award-winning service plans, will introduce another industry first, BBMTM Unlimited, which features worldwide unlimited access to BlackBerry® Messenger (BBMTM) and talk and text with payments that shrink to as low as $30 a month. Continuing the Boost Mobile trend of offering more choice, flexibility and value, this offer is available beginning on July 10 exclusively with the BlackBerry® CurveTM 9310 smartphone, which is launching the same day for $99.99 (excluding taxes). BBM, available for all BlackBerry users worldwide, is one of the largest mobile social networks with more than 56 million active customers globally. Customers can experience real-time communications and easily chat with friends at the speed of now, with instant responses and "read" confirmations. Plus, BBM goes beyond chat with more than 1,000 BBM-connected apps available for download on BlackBerry App WorldTM. BBM-connected applications offer a social, interactive experience that's not available on any other smartphone platform. "We have partnered closely with RIM to enhance the Boost Mobile line-up and launch the first-ever no-contract BlackBerry smartphone priced under $100," said Andre Smith, vice president-Boost Mobile. "This breakthrough device is matched with the most affordable BlackBerry service plan in the industry with shrinking payments and unlimited talk, text and worldwide BlackBerry Messenger." Similar to other monthly unlimited plans offered by Boost Mobile, the $45 BBM Unlimited plan provides customers the opportunity to be rewarded for simply making on-time payments. For every six on-time payments, customers will see their monthly payment shrink by $5, eventually getting down to as low as $30 a month for unlimited nationwide talk and text and worldwide BBM access. Payments do not need to be consecutive to qualify for these saving milestones. 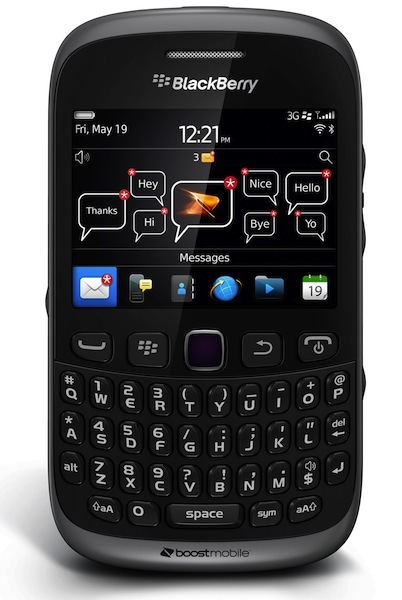 BlackBerry Curve 9310 gives consumers the full power of the BlackBerry messaging and social-centric applications in the familiar BlackBerry Curve form factor. The smartphone will be available at Boost Mobile exclusive retail stores, select independent wireless dealer locations nationwide and at www.boostmobile.com with free shipping. It will also be available at select Best Buy locations next month.